Johann Nepomuk Hummel was an Austrian pianist and composer of the Classical and early Romantic period, prolific in a variety of genres. His Sonata for Flute and Piano in D major, Opus 50, was written in Vienna between 1810 and 1814. The alternative of violin to flute is also allowed, but this is undoubtedly a commercial concession, since the music is well suited to the wind instrument. 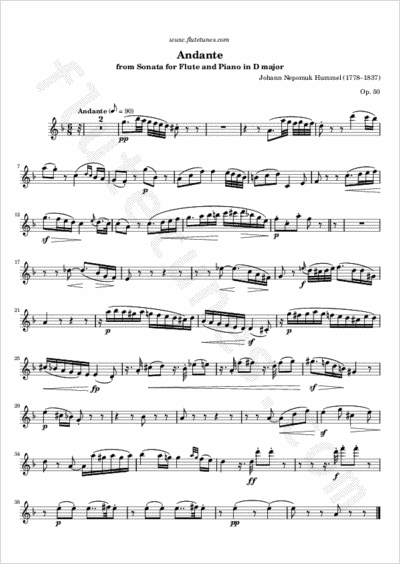 Today we present the second movement, a slow Andante in 6/8 time. Thanks to Paulien for suggesting this movement!